Corpse Flower Science: Will one Titan Twin bloom longer? We never really considered the possibility that we might have two plants developing inflorescences at the same time. But it did not take too long to brainstorm some ideas on what we hope to learn from this rare possibility. We have nicknamed these corpse flowers the Titan Twins because they grew from seed from the same parent plant. The plants have been named Java and Sumatra, in recognition of two of the major islands in the nation of Indonesia. Amorphophallus titanum, the Latin name for the titan arum species, is native to the island of Sumatra. The corms of the Titan Twins were almost identical in weight when they were measured several months ago; the young inflorescences emerged from the soil within 24 hours of each other, and until recently, they were within an inch of each other in height. On May 18, Java became—and remained—the taller of the two. A school field trip visits the two titan arums on May 23, 2017. So what will we do to take advantage of possibly having two sibling plants coming into flower at the same time? We can’t cross-pollinate them, because this species has an incompatibility system that prevents successful fertilization between closely related individuals. Even if this weren’t the case, we want to maintain the highest levels of genetic diversity when producing offspring of this rare species—a conservation practice common among captive breeding programs of animals in zoos. (The Garden began collecting titan arums in 2003, as part of a worldwide conservation effort to preserve the species.) We do hope to pollinate one of the titan arums with pollen from an individual from another institution that has been stored “on ice” for just such an occasion. Having two plants blooming at nearly the same time allows us do an experiment to answer a question about what happens to the inflorescence just after pollination. 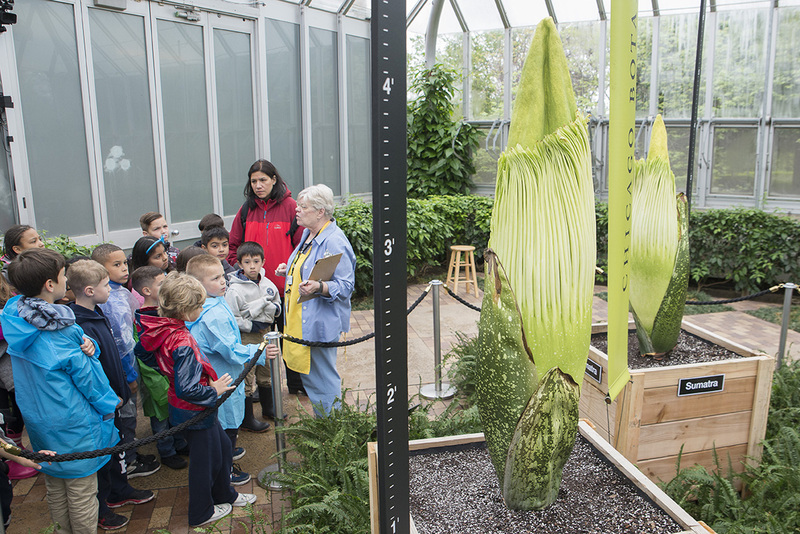 When Alice the Amorphophallus and Sprout bloomed at the Garden (Alice in September 2015 and Sprout in April 2016), we wondered if pollination of the female flowers influences how long the plant generates odor and heat. It is possible that when pollination takes place, it signals the plant to save energy and stop these energetically expensive processes. After all, pollination of the female flowers basically signals to the plant, “job well done.” Perhaps at that point, there’s no need to continue with the energy-intense display. Dr. Pati Vitt checks out the pollination situation on our April 2016 bloom, Sprout. With two plants from the same parentage blooming at nearly the same time, we can do the experiment that could answer this question. We will not pollinate Java, the first plant that came into bloom, and then pollinate Sumatra, assuming it does open. We will record heat at regular intervals through use of a thermal camera and determine if the unpollinated inflorescence produces heat for a longer period than the pollinated one. Measuring odor production will be a bit more subjective—that will require sniff tests, and an abundant supply of fresh noses. Hopefully we will find some volunteers! 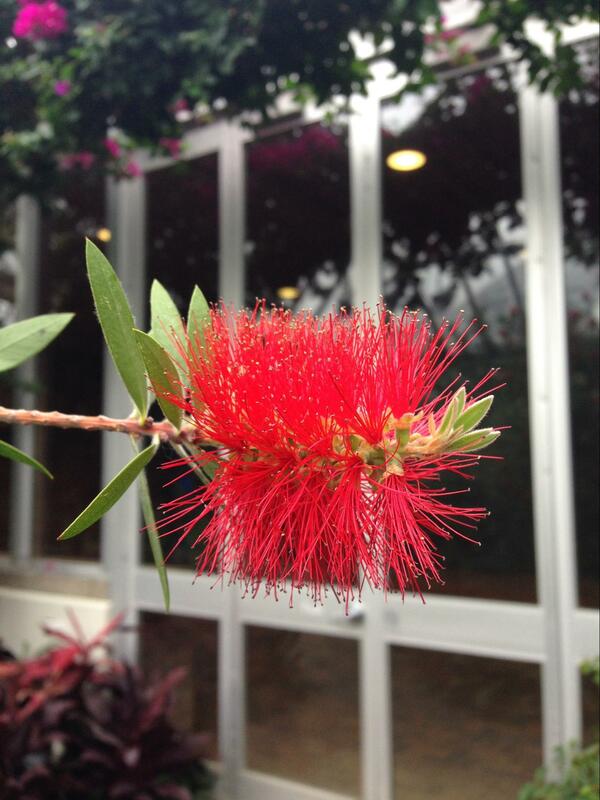 Check the video feed on the website, and plan your visit to see the titans in bloom today! Posted on May 31, 2017 May 31, 2017 Author Patrick HerendeenCategories Horticulture & Display GardensTags amorphophallus titanum, corpse flower, pollination study, titan arum, titan arum pollination experimentLeave a comment on Corpse Flower Science: Will one Titan Twin bloom longer? When it comes to controlling invasive plants, a little faith can’t hurt. This is particularly true for garlic mustard (Alliaria petiolata). We have been struggling to get this highly invasive biennial plant under control at the Chicago Botanic Garden for more than 20 years. When I first began working on restoration of our 100-acre Mary Mix McDonald Woods, it took weeks of hand-pulling with many volunteers each spring to clear just 10 or 11 acres. After years of not letting the garlic mustard set seed in the McDonald Woods, a few years ago we finally began to see a light at the end of the tunnel (though we’d still end up with mountains of pulled garlic mustard each year). Thanks to the tremendous help of Garden volunteers, garlic mustard growth in the Woods has finally been curtailed, and each year we are now able to remove all flowering garlic mustard in the Woods’ entire 100 acres. 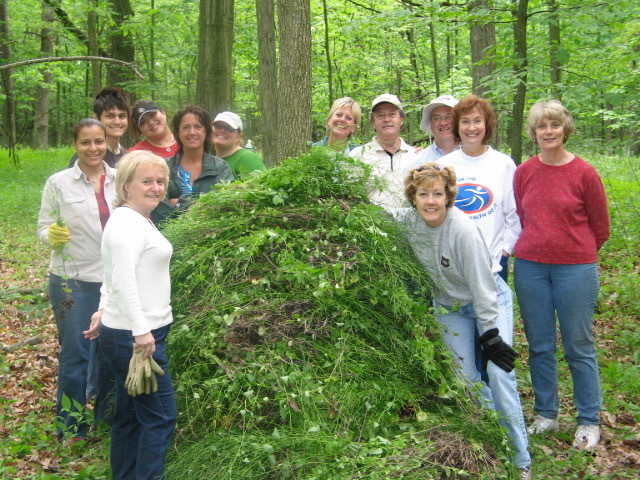 Over nearly two decades, Garden volunteers have played a critical role in helping remove garlic mustard from the McDonald Woods. About six or seven years ago, we began a new ecological restoration project in the Barbara Brown Nature Reserve (located at the south end of the Garden near Dundee Road). The area was highly degraded and choked with buckthorn shrubs (Rhamnus cathartica). After the buckthorn was removed, the following spring was a nightmare in terms of garlic mustard. Acres upon acres of garlic mustard monoculture required removing several dump truck loads just to begin making a dent in the population. After buckthorn was removed from the Barbara Brown Nature Reserve, garlic mustard plants completely dominated the understory vegetation for several years. Garlic mustard became so dense in the Brown Nature Reserve that we were reluctant to pull it, since the resulting soil disturbance would greatly enhance sprouting of the soil’s dormant garlic mustard seeds. Fortunately, one of the Garden’s creative mechanics devised a basket system on a hand-held scythe. 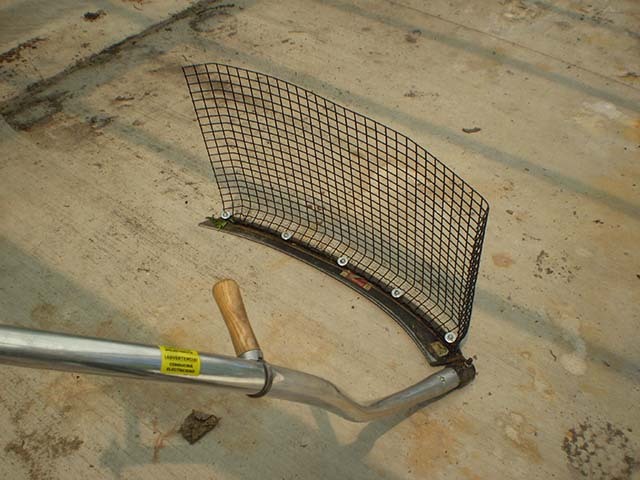 This ingenious tool allows us to harvest the plant tops by cutting and collecting the unripe seedpods—but unlike hand-pulling, using this tool completely eliminates soil disturbance. Although the Reserve covers only six acres, in the first few years we were not able to remove all the garlic mustard plants before they began to drop their seed. This led to several more years of hand-harvesting to get the population more under control. Fast forward to spring 2017, and we’ve only found about 75 flowering plants to remove so far. What was once viewed as an impossible goal to achieve (i.e., near-total elimination of flowering garlic mustard from the reserve) has actually happened! Too good to be true, perhaps? This ingenious device fabricated by one of the Garden’s maintenance mechanics allows us to capture the garlic mustard’s unripe seedheads cut by the scythe’s sharp blade (the curved metal piece along the bottom). 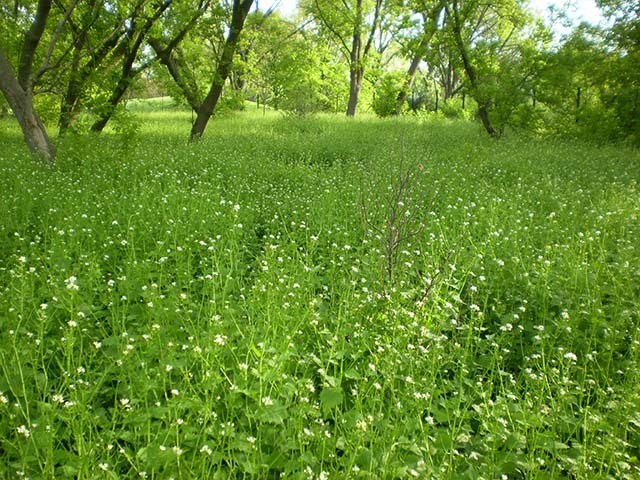 There have been recent field observations circulating in the Chicago region regarding a possible disease that apparently is having a significant negative effect on garlic mustard (see woodsandprairie.blogspot.com). Over the past several weeks, observers have reported an almost complete absence of garlic mustard in areas that are undergoing habitat restoration—and this absence has even been observed in areas where no invasive species management has been done. Further, some restoration workers have reported garlic mustard with very “weird” rhizomes that have many small plants emerging along them. This is not at all a normal growth form for garlic mustard. The speculation is that a virus or some other pathogen is deforming and/or killing the plants. This potential pathogen might explain why we have observed such an incredible decline of garlic mustard at the Barbara Brown Nature Reserve this spring. I have also taken note of several roadside areas along my commute to work that in past years had dense stands of garlic mustard. This spring, I’m not seeing any garlic mustard flowers there at all. Yet quite interestingly, I’m still seeing dense stands this spring in areas outside the Chicago area. What’s going on with our region’s garlic mustard?! The next few weeks offer a great opportunity for Garden members to check their yards and other nearby areas that in previous years had shown dense stands of flowering garlic mustard. Maybe you’ll see a dramatic decline as well. Since this seems to be a very recent phenomenon, natural resource managers will need to continue monitoring to see if the decline persists. Wouldn’t it be great if nature offers a way to rid our region of an invasive plant that has been plaguing our natural areas for so long? Stay tuned! If you’ve been around the Regenstein Center in the past couple of months, you may have seen me around the librarian’s suite, Skyping in the library’s rare book room, training at the circulation desk or maybe having lunch in the break room. 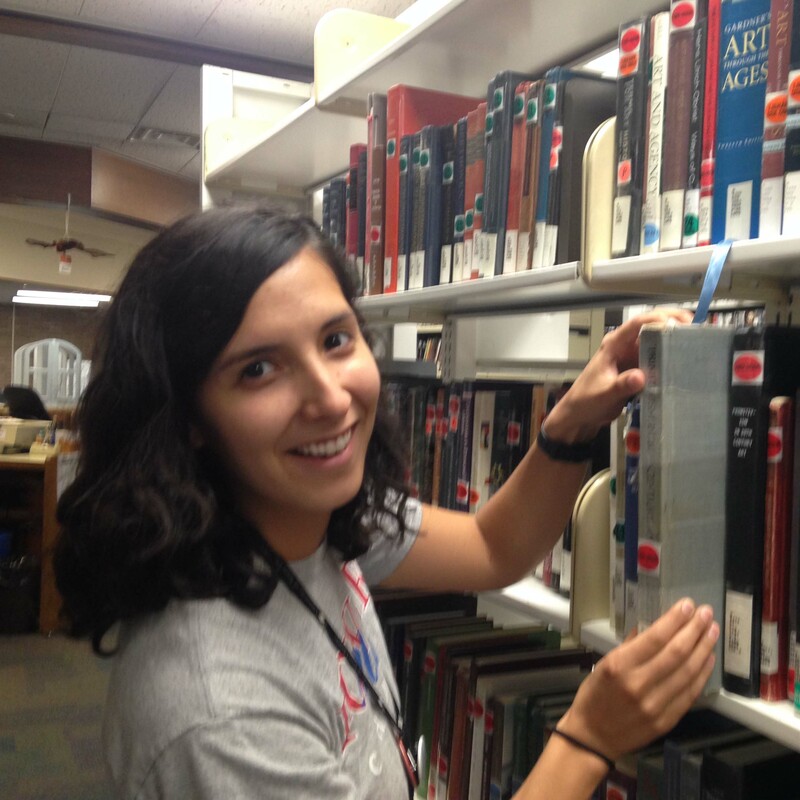 I’m Alicia Esquivel, a new addition to the library staff for 2017 who will be working at the Chicago Botanic Garden’s Lenhardt Library as a resident on a collaborative project funded by the Institute of Museum and Library Services. My cohort and I are hosted at different institutions across the United States (including the Museum of Comparative Zoology at Harvard, Natural History Museum Los Angeles, Smithsonian Libraries, Missouri Botanical Garden, and the Chicago Botanic Garden) and we are all researching best practices for digital libraries and making recommendations for improvement to the Biodiversity Heritage Library (BHL). BHL is a group of natural history and botanical libraries that work together to digitize books and articles about biodiversity and make them freely available to access and use. Over the past ten years, BHL has uploaded more than 50 million pages of biodiversity literature for public use. My particular project is to define how much biodiversity literature is in the public domain and how much of it still needs to be added to BHL. This content analysis will help focus future digitization efforts by BHL and fill in gaps in the collection. By making this material available online for free, scientists and researchers from all over the world can have access to research needed to make new discoveries. This is especially helpful for scientists who may not be located near a library with the materials that they need. For more information on all of our projects and updates throughout the year, follow our blog! My phone’s camera roll is quickly filling up as I find a new, beautiful plant every day on my walk in to work. I’m excited to be hosted at the Chicago Botanic Garden this year—this is my first time working at a botanic garden and I have a lot to learn about how a living museum functions and operates. I got to meet Boyce Tankersley from Living Plant Documentation and was blown away by all of the data his department is responsible for managing and all of the work his volunteers do. We have similar missions of creating and maintaining open data that can be linked and shared with other platforms to make discoveries. Working at the Garden has inspired me to do some small-scale gardening (apartment living) of my own. After checking out a couple of books from the library, I started a windowsill planter of mixed herbs from seeds this spring. If anything goes wrong (quite possible), I know I can ask the Plant Information Service for help! 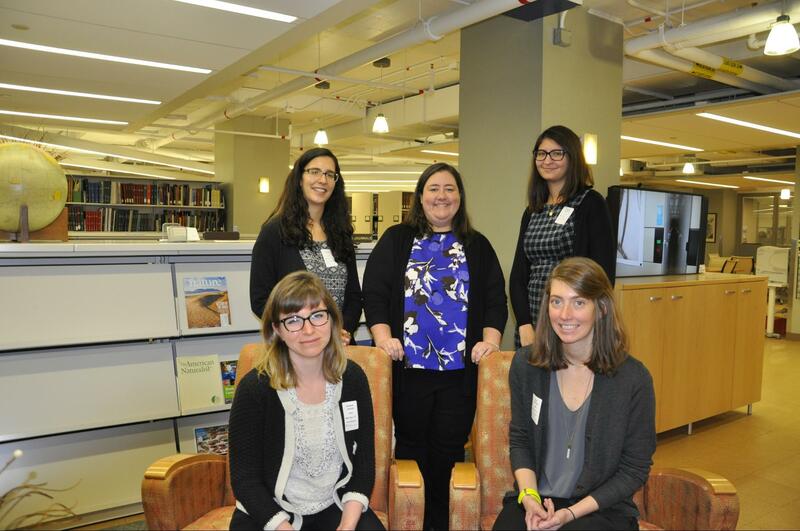 Alicia Esquivel is a National Digital Stewardship Resident hosted at the Chicago Botanic Garden’s Lenhardt Library. Before moving to Chicago, she received a B.A. in art history from the University of Houston and a M.S. in information science from the University of Texas at Austin. Alicia is enthusiastic about transforming data into useful information to facilitate research. In her free time she enjoys reading fiction, baking bread, and watching live comedy. Like you, the staff at the Chicago Botanic Garden has been tracking the recent rains. We know many of you are anxious to get planting done—it is spring, right? But we encourage caution and patience. If it squishes, wait. Working with wet soil and turf damages it. Wait until the soil dries out to get back in your garden. If the soil can form a sticky ball when you squeeze a handful, it is still too wet for planting. Soil will take longer to dry after periods of cool weather. Sandy soils can be worked much sooner after a rain event. Clay soil holds more moisture and requires a longer waiting time. Avoid excessive walking in garden beds and on lawns. 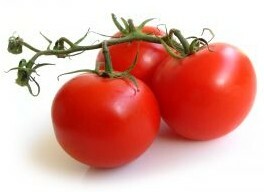 It can compact and damage your soil. Soil is ready for planting when it crumbles in your hand. Working the soil when it is too wet can increase compaction and break down the structure of the soil, leaving you with hard crusts or clumps when it dries out. Don’t mow a lawn that is excessively wet. 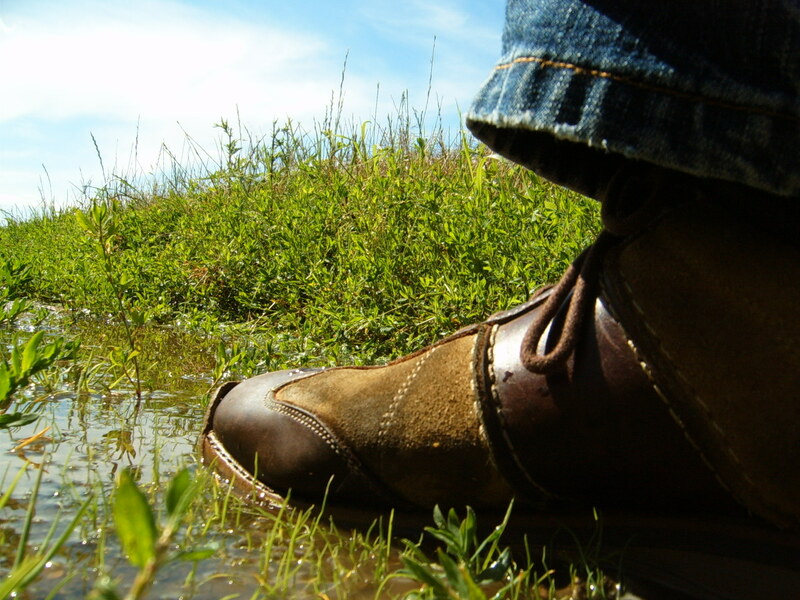 A lawn is too wet when you see standing water, or water comes up from the ground as you step on the lawn. In these conditions, the mower tires will leave muddy tracks that will damage your lawn. Now is the time to get in some really satisfying weeding! Do pull weeds once your soil has dried a bit. 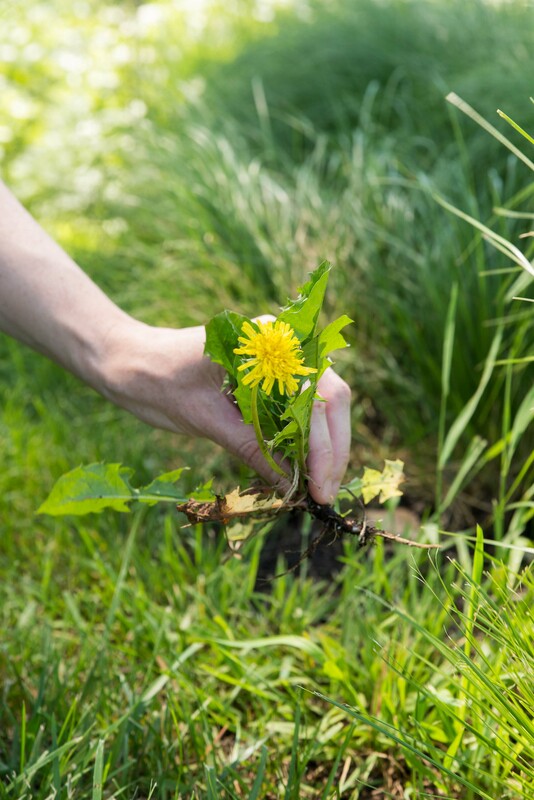 Weeds are more easily pulled when the ground is moist (but not wet). Work from the edges of the beds to pull weeds without compacting soil or damaging other plantings. Mulch beds once the soil has dried out. Be sure the beds are sufficiently dry. Drainage issues? If you can, collect water that has pooled. In order to correct a drainage problem, you will first have to move the excess surface water that is pooling in low areas. Then you can consider the different options to improve drainage, taking into account soil type and natural changes in grade. The Garden recommends waiting to plant warm-season flowering annuals, vines, herbs, and vegetables until after the Chicago area’s average last frost date of May 15. Cautious gardeners often wait until Memorial Day before setting out cold-sensitive plants such as tomatoes, peppers, eggplants, and squash.